in gnosticism referring to a Feminine-Principle known as Sophia-Achamoth. Mary Magdalene is described, both in the canonical New Testament and in the New Testament apocrypha, as a devoted disciple of Jesus. She is considered by the Roman Catholic, Eastern Orthodox, and Anglican churches to be a saint, with a feast day of July 22. She is also commemorated by the Lutheran Church with a festival on the same day. Mary Magdalene's name identifies her as the "Mary of Magdala," after the town she came from, on the western shore of the Sea of Galilee. Her name distinguishes her from the other Marys referred to throughout the New Testament. Yet the life of the historical Mary Magdalene is the subject of ongoing debate. Of particular interest is the question of her supposed identity as a prostitute, for which there is no direct biblical evidence. Her devotion to Jesus has led to a tradition that she may have been Jesus' wife, lover, or intended bride. In the early dawn of the first day of the week Mary Magdalene, and Mary the "mother of James," Matthew, Mark, and Peter came to the sepulcher in which Jesus' body had been placed with sweet spices to preserve the body. They found the sepulcher empty but saw the "vision of angels" (Matthew 28:5). As the first witness to the empty tomb, Mary Magdalene went to tell Simon Peter and "the other disciple, the one whom Jesus loved," (John 20:1-2), (gaining her the epithet "apostle to the apostles") and again immediately returned to the sepulcher. She remained there weeping at the door of the tomb. This is the last entry in the canonical Gospels regarding Mary of Magdala, who now returned to Jerusalem. She is probably included in the group of women who joined the Apostles in the Upper Room in Jerusalem after Jesus' ascension (Acts 1:14). Tradition as early as the third century (Hippolytus, in his Commentary on Song of Songs) identifies Mary Magdalene with Mary of Bethany and the "sinful woman" who anointed Jesus' feet at the home of Simon the Pharisee. Anthony Frederick Augustus Sandys. Mary Magdalene. ca. 1860. And, behold, a woman in the city, which was a sinner, when she knew that Jesus sat at meat in the Pharisee's house, brought an alabaster box of ointment, and stood at his feet behind him weeping, and began to wash his feet with tears, and did wipe them with the hairs of her head, and kissed his feet, and anointed them with the ointment. Now there was a certain man sick, named Lazarus, of Bethany, of the town of Mary and Martha her sister. And Mary was she that anointed the Lord with ointment, and wiped his feet with her hair: whose brother Lazarus was sick. The identification of Mary Magdalene with Mary of Bethany and "the woman who was a sinner" is reflected in an influential sermon Pope Gregory I gave in 591, which said: "She whom Luke calls the sinful woman, whom John calls Mary (of Bethany), we believe to be the Mary from whom seven devils were ejected according to Mark." While the Catholic Church has not issued a binding view on this, Catholics have traditionally agreed with Gregory and identified both Mary of Bethany and the sinful woman of Capernaum with Mary Magdalene. Eastern Orthodox Christians distinguish between Mary Magdalene on the one hand and Mary of Bethany, "the woman who was a sinner," on the other hand. Protestant views on the issue vary widely. 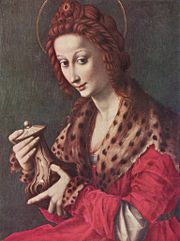 A Renaissance depiction of Mary Magdalene, holding a jar of anointing oil, although the New Testament does not name her as one of the women who anointed Jesus. Magdalene's long red hair openly displayed, while Mother Mary is portrayed with her hair modestly covered. On the basis of her identification as the "sinful woman" of Capernaum, Mary Magdalene is often referred to as a prostitute, but she was never called one in the New Testament. Religion scholar Jeffrey Kripal wrote, "Migdal was a fishing town known, or so the legend goes, for its perhaps punning connection to hairdressers (medgaddlela) and women of questionable reputation. This is as close as we get to any clear evidence that Mary Magdalene was a prostitute". According to Kripal, the traditional identification of Mary Magdalene as a prostitute also goes back to the above-mentioned sermon by Pope Gregory. In this sermon, Gregory identified Mary as peccatrix, a sinful woman, using her as a model for the repentant sinner, but he did not call her meretrix, a prostitute. However, he also identifies Mary with the adulteress brought before Jesus (as recounted in the Pericope Adulterae, John 8), supporting the view of third and fourth century Church fathers that had already considered this sin as "being unchaste." Gregory's identification and the consideration of the woman's sin as sexual later gave rise to the image of Mary as a prostitute. This viewpoint is also espoused by much medieval and Renaissance Christian art. 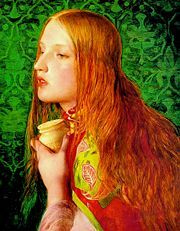 In many, if not most, medieval depictions, Mary Magdalene is shown as having long red hair, which she wears down over her shoulders. This was generally taken to be a sign of sexual impropriety in women at the time. The other women of the New Testament, in similar depictions, ordinarily have dark hair that is kept beneath a scarf. This image of Mary as a prostitute was followed by many writers and artists until the twentieth century. Even though it is less prevalent nowadays, the identification of Mary Magdalene with the adulteress is still accepted by some Christians. This is reflected in the Martin Scorsese's film adaptation of Nikos Kazantzakis's novel The Last Temptation of Christ and Mel Gibson's The Passion of the Christ. The Eastern Orthodox Church maintains that Mary Magdalene, distinguished from Mary of Bethany, retired to Ephesus with the Theotokos (Mary the Mother of God) and there died. Her relics were transferred to Constantinople in 886 and are there preserved. Gregory of Tours, writing in Tours in the sixth century, supports the tradition that she retired to Ephesus. Western tradition, however, includes the idea of Magdalene settling farther north and west. How a cult of Mary Magdalene first arose in Provence has been summed up by Victor Saxer in La culte de Marie Magdalene en occident (1959). Mary Magdalene's relics were first venerated at the abbey of Saint-Maximin Vézelay in Burgundy. Afterward, since September 9, 1279, the supposed body of Mary Magdalene was also venerated at Saint-Maximin-la-Sainte-Baume, Provence. 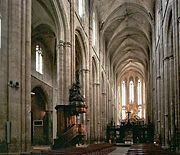 This cult attracted such throngs of pilgrims that the earlier shrine was rebuilt as the great Basilica from the mid-thirteenth century, one of the finest Gothic churches in the south of France. The competition between the Cluniac Benedictines of Vézelay and the Dominicansof Saint-Maxime occasioned a rash of miraculous literature supporting one or the other site. Jacopo de Voragine, compiling his Legenda Aurea before the competition arose, characterized Mary Magdalene as the emblem of penitence, washing the feet of Jesus with her copious tears, protectress of pilgrims to Jerusalem, daily lifting by angels at the meal hour in her fasting retreat and many other miraculous happenings in the genre of Romance, ending with her death in the oratory of Saint Maximin, all disingenuously claimed to have been drawn from the histories of Hegesippus and of Josephus. The French tradition of Saint Lazare of Bethany is that Mary, her brother Lazarus, and Maximinus, one of the Seventy Disciples, together with some companions expelled by persecutions from the Holy Land, traversed the Mediterranean in a frail boat with neither rudder nor mast and landed at the place called Saintes-Maries-de-la-Mer near Arles. Mary Magdalene came to Marseille and converted the whole of Provence. 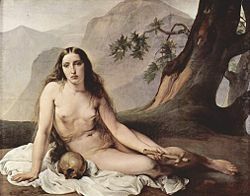 Magdalene is said to have retired to a cave on a hill by Marseille, La Sainte-Baume ("holy cave," baumo in Provencal), where she gave herself up to a life of penance for 30 years. When the time of her death arrived she was carried by angels to Aix and into the oratory of Saint Maximinus, where she received the viaticum; her body was then laid in an oratory constructed by St. Maximinus at Villa Lata, afterwards called St. Maximin. In 1279, when Charles II, King of Naples, erected a Dominican convent at La Sainte-Baume, the shrine was found intact, with an explanatory inscription stating why the relics had been hidden. 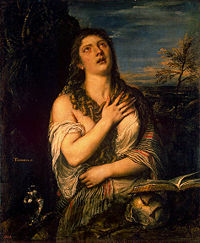 The penitent Mary Magdalene, a much reproduced composition by Titian. In 1600, the relics were placed in a sarcophagus commissioned by Pope Clement VIII, the head being placed in a separate reliquary. The relics and free-standing images were scattered and destroyed at the Revolution. In 1814, the church of La Sainte-Baume, also wrecked during the Revolution, was restored, and, in 1822, the grotto was consecrated afresh. The head of the saint now lies there and has been the center of many pilgrimages. The traditional Roman Catholic feast day dedicated to Mary Madgalene celebrated her position as a penitent. However, this was changed in 1969, with the revision of the Roman Missal and the Roman Calendar, and now there is no mention in either of Mary Magdalene as a sinner . Magdalene became a symbol of repentance for the vanities of the world of various sects, both Catholic and non-Catholic. Magdalene was the patron of Magdalen College, Oxford, and Magdalene College, Cambridge (both pronounced "maudlin" ). In contrast, her name was also used for the Magdalen Asylum, institutions for "fallen women," including the infamous "Magdalen Laundries" in Ireland. 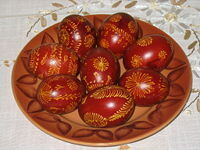 For centuries, it has been the custom of many Christians to share dyed and painted eggs, particularly on Easter Sunday. The eggs represent new life, and Christ bursting forth from the tomb. Among Eastern Orthodox this sharing is accompanied by the proclamation "Christ is risen!," and the person being addressed would respond "Truly He is risen!." 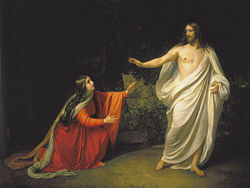 One tradition concerning Mary Magdalene says that following the death and resurrection of Jesus, she used her position to gain an invitation to a banquet given by Emperor Tiberius Caesar. When she met him, she held a plain egg in her hand and exclaimed "Christ is risen!" Caesar laughed, and said that Christ rising from the dead was as likely as the egg in her hand turning red while she held it. Before he finished speaking, the egg in her hand turned a bright red, and she continued proclaiming the Gospel to the entire imperial house. Another version of this story can be found in popular belief, mostly in Greece. It is believed that after the Crucifixion, Mary Magdalene and the Virgin put a basket full of eggs at the foot of the cross. There, the Eggs were painted red by the blood of the Christ. Then, Mary Magdalene brought them to Tiberius Caesar (see above). 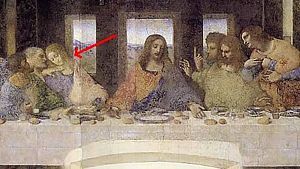 The Beloved Disciple in Da Vinci's Last Supper is thought by some to be Mary Magdalene. For one early group of Christians Mary Magdalene was a leader of the early Church and possibly even the Beloved Disciple, to whom the Gospel of John is normally ascribed. Ramon K. Jusino offers an explanation of this view, based on the textual researches of Raymond E. Brown in 1998. Ann Graham Brock and Elaine Pagels have demonstrated Mary Magdalene often figures in the portrayal of authority structures of the early church, with orthodox-hierarchical sources tending to emphasize the role of Peter and heterodox sources tending to emphasize the role of Magdalene. These scholars also observe that the Mary Magdalene figure is consistently elevated in writings from which formal leadership roles are absent. In certain texts, while either Peter or Paul is more involved, Mary Magdalene's role is often diminished, while in other texts, the opposite occurs. The Gnostic, apocryphal Gospel of Mary Magdalene survives in two third century Greek fragments and a longer fifth century translation into Coptic. These manuscripts were first discovered and published between 1938 and 1983, but as early as the third century there are patristic references to the Gospel of Mary. These writings reveal the degree to which that gospel was despised and dismissed by the early Church Fathers. In the fragmentary text, the disciples ask questions of the risen Savior (a designation that dates the original no earlier than the second century) and are answered. Then they grieve, saying, "How shall we go to the Gentiles and preach the Gospel of the Kingdom of the Son of Man? If even he was not spared, how shall we be spared?" Mary bids them take heart: "Let us rather praise his greatness, for he prepared us and made us into men." She then delivers—at Peter's request—a vision of the Savior she has had, and reports her discourse with him, which shows Gnostic influences. "But Andrew answered and said to the brethren, 'Say what you think concerning what she said. For I do not believe that the Savior said this. For certainly these teachings are of other ideas." "Peter also opposed her in regard to these matters and asked them about the Savior. "Did he then speak secretly with a woman, in preference to us, and not openly? Are we to turn back and all listen to her? Did he prefer her to us?" Dr. Karen King, a professor of church history at Harvard Divinity School, has observed, "The confrontation of Mary with Peter, a scenario also found in The Gospel of Thomas,, Pistis Sophia,, and The Greek Gospel of the Egyptians, reflects some of the tensions in second-century Christianity. Peter and Andrew represent orthodox positions that deny the validity of esoteric revelation and reject the authority of women to teach." Mary seeks to embrace Jesus. Some modern writers have come forward with claims that Mary Magdalene was the wife of Jesus. These writers cite the above mentioned Gnostic writings to support their argument. Sources like the Gospel of Philip do depict Mary Magdalene as being closer to Jesus than any other disciple. However, there is no known ancient document that claims she was his wife; rather, the Gospel of Philip depicts Mary as Jesus' koinonos, a Greek term indicating a 'close friend', 'companion' or, potentially, a lover. The closeness described in these writings depicts Mary Magdalene, representing the Gnostic believer, as understanding Jesus and his teaching while the other disciples, representing the orthodox church, did not. Kripal writes that "the historical sources are simply too contradictory and simultaneously too silent" to make absolute declarations regarding Jesus' sexuality. Proponents of a married status of Jesus argue that bachelorhood was very rare for Jewish males of Jesus' time, being generally regarded as a transgression of the first mitzvah (divine commandment) — "Be fruitful and multiply." According to this reasoning, it would have been unthinkable for an adult, unmarried Jew to travel about teaching as a rabbi. 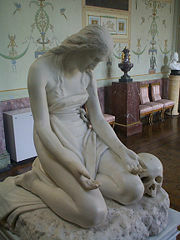 Penitent Magdalene, by Antonio Canova. A counter-argument to this is that the Judaism of Jesus' time was very diverse and the role of the rabbi was not yet well defined. It was really not until after the Roman destruction of the Second Temple in 70 C.E. that Rabbinic Judaism became dominant and the role of the rabbi made uniform in Jewish communities. Before Jesus, celibate teachers were known in the communities of the Essenes, and John the Baptist also was apparently unmarried, as was the prophet Jeremiah, after whom Jesus may have patterned himself. Later, Paul of Tarsus was an example of an unmarried itinerant teacher among Christians. In orthodox tradition, Jesus himself approved of voluntary celibacy for religious reasons and explicitly rejected a duty to marry: "There are eunuchs, who have made themselves eunuchs for the kingdom of heaven. He that can take, let him take it." (Matthew 19:12). 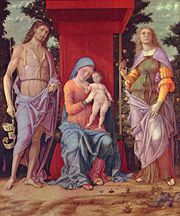 Certain of the Gnostics, the community that Mary represented in the literature in question, did not condone sexual union at all. The idea that Mary Magdalene was the wife of Jesus was popularized by books like the Holy Blood, Holy Grail(1982), The Gospel According to Jesus Christ (1991), Bloodline of the Holy Grail: The Hidden Lineage of Jesus Revealed (1996), The Da Vinci Code (2003). It has been further popularized by the documentary The Lost Tomb of Jesus, which discusses the Talpiot tomb. Supposedly, this is the tomb of Jesus, Mary Magdalene, and Judah, their "son." Writers employing metaphysical analogy and allegory assert that Christ was already married — to the Church. ↑ "Saint Mary Magdalen". 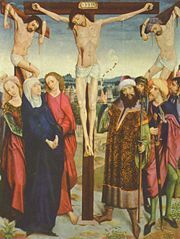 New Catholic Dictionary www.catholic-forum.com. (1910). Retrieved on July 24, 2007. ↑ 2.0 2.1 Mary Magdalen. Patron Saints Index www.catholic-forum.com. Retrieved July 24, 2007. ↑ It is debated whether this Mary was the mother of Jesus' disciple James or the mother of James, the "brother of the Lord." Catholic tradition denies that Mother Mary was James' mother, but Protestant tradition tends to accept that Mary was indeed the mother of both Jesus and James. ↑ Saxer, La culte de Marie Magdalene en occident (1959). ↑ Mary Magdalene. www.catholic.org. Retrieved July 24, 2007. ↑ "Mary Magdalene, author of the Fourth Gospel?". ramon_k_jusino.tripod.com. Retrieved July 24, 2007. All links retrieved August 28, 2014. 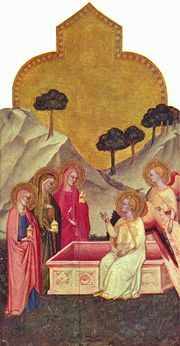 Legends of Mary Magdalene. www.thenazareneway.com. Professor Christopher Witcombe's Art History course Da Vinci's Code section on Mary Magdalene at Sweet Briar College. witcombe.sbc.edu. St Mary Magdalene, Catholic Encyclopaedia 1911. Content is available under Creative Commons Attribution/Share-Alike License; additional terms may apply.